Smashwords or your favourite online store. With the instability of the global economy, you may be looking for answers on how to survive. Many people hesitate to go to financial planners and ask questions because they don’t understand the financial world and they are afraid of being given bad advice. If you are one of these people, this book and the seminar are perfect for you. Morris Publishing Australia. From the WHOLESALE ORDERS page. Stop right now and consider how you actually think about your own personal economy. Here are a few very simple things to think about when it comes to your life. * Are you trading hours for less than you think you are really worth? * Is your picture of the future more bills than your bank balance or income can handle? * Does talk of interest rate rises, a fuel price hike, or the price of bananas for that matter, leave you feeling somewhere between being a bit scared and totally overwhelmed? Welcome to the real world of the workplace and wages. There is hope though. Improvement comes from first being aware that things could be much better, then being prepared to do something about it. In his great work, ‘How to Win Friends and Influence People’, Dale Carnegie said, “If you act enthusiastically, you will be enthusiastic.” It can be a bit hard though if you are working eighteen hours a day just to make ends meet. The good news is, when some pressure is removed, there’s more energy and enthusiasm for ideas that will make life much better. Imagine a couple of people with two good jobs and decent incomes who are living a fairly comfortable life. It would create serious financial headaches if they lost one or both incomes. They’d spend a lot of time and energy stressed out without really knowing where the stress had come from. Most of their problems would be about the lack of money following the loss of the income. After hearing this story from a client, I began to think of ways to really help. This developed into the Seven Keys of Economic Vision™, which my financial-planning clients often heard. 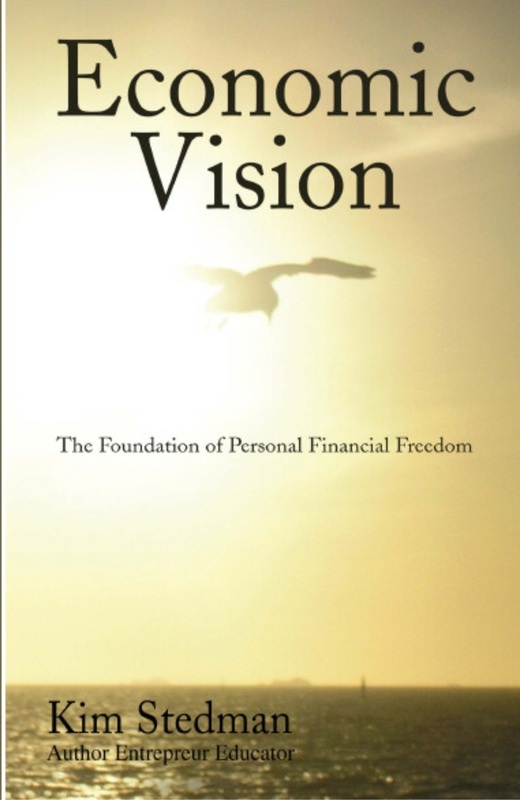 Economic Vision’s Seven Keys are designed to make us THINK about what money really means to us and its’ role in our life. ALSO, how new ways of looking at it, thinking about it, and using it correctly can make a huge difference. All you have to do is follow the ideas covered in the following chapters. Anything is simple when broken down into little bits. Or as we call them, keys. These keys are important for the whole thing to work. As you follow them, you’ll get better and better at doing what it takes to create your own financial freedom. For everything beyond financial freedom, we just use the same system. This book provides a step by step approach to understanding how best to utilise our money and our time to make life easier. The seven keys are laid out in order so that each step leads towards the things you want. Be that security for the family, becoming debt free and progressively being able to improve your lifestyle no matter what the economic climate.